A conservatism that is hopeful about what tomorrow might bring. "The Wind and the Sun were disputing which was the stronger. Suddenly they saw a traveller coming down the road, and the Sun said: "I see a way to decide our dispute. Whichever of us can cause that traveller to take off his cloak shall be regarded as the stronger. You begin." One of the greatest differences between the American Republican and British Tory parties has been dispositional. Under Margaret Thatcher British Tories handbagged a failing Britain back to life. 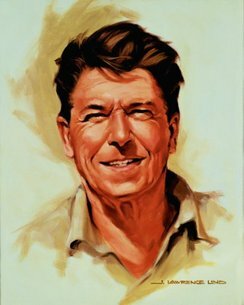 President Ronald Reagan’s approach was different. He encouraged America back to vigour and his ‘Morning in America’ commercials encapsulated his optimism. Whilst George W Bush inherited Reagan’s optimism the Conservative Party has often appeared to prefer the nannying style of Margaret Thatcher to sunny uplands optimism. The red-teared lions and devil imagery of the 1997 campaign were the least attractive manifestation of this inheritance. The same pattern is true in the commentariat. Doom-mongery sometimes has its place but the brilliant analysis of Peter Hitchens isn’t balanced by the kind of optimism that the likes of Peggy Noonan give to American conservatism. This stuff drives the Democrats wild and into the hands of Howard Dean and other webroot manifestations of the MooreOn tendency. The Reagan-Bush positivity seems to have two principal origins. One source of American conservatism’s optimism is the Bible Belt. George W Bush’s conversion story is one that millions of Americans can identify with. 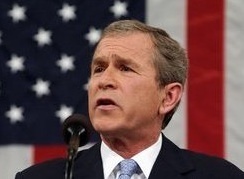 Now teetotal, George W Bush was a heavy-drinker until his fortieth birthday. “I was a drinker. I quit drinking because I changed my heart. I guess I was a one-man faith-based programme,” he told a gathering of religious leaders in New Orleans. In his campaign autobiography he wrote: “Faith changes lives. I know, because faith has changed mine”. The other source has been the prominence of a number of liberals-turned-neoconservatives in the highest echelons of the Republican Party. They may have abandoned the methods of the left but they have not ditched its idealism.